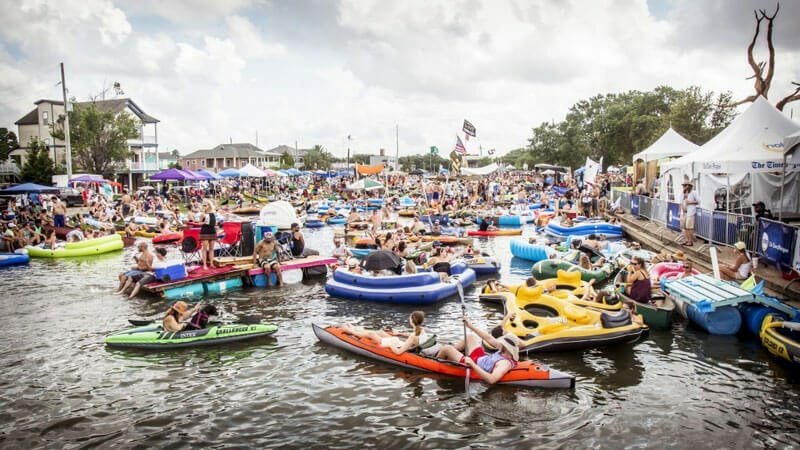 One of the standouts in the seemingly never-ending string of festivals New Orleans hosts all year round is Bayou Boogaloo, which grew from the post-Katrina scrappy little neighborhood festival to a four-stage, weekend-long extravaganza. Since its inception in 2006, Bayou Boogaloo now draws upwards of 35,000 people and has become as much a fixture on the festival calendar as its Mid-City neighbor, JazzFest, and the city’s street-party season opener, French Quarter Fest. 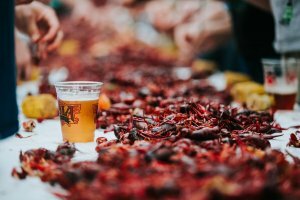 Also a favorite of both the locals and the in-the-know visitors, this festival is taking place not in the French Quarter but on the sprawling, picturesque banks of Bayou St. John between Dumaine Streets and Lafitte Avenue in the in Mid-City neighborhood. Its bucolic setting as a floating party, with its flotillas of inflatables, paddleboats and kayaks, gives the three-day festival its own unique character. This year, Bayou Boogaloo falls on Friday, May 18 – Sunday, May 20. Just like in the previous years, the festival is pet- and kid-friendly, and has a stellar lineup of live music on its four stages, including the best of the brass bands, zydeco, Mardi Gras Indians, and other incredible New Orleans and Louisiana acts. In the past, the Boogaloo has hosted everyone from Irma Thomas to Lost Bayou Ramblers and Beausoleil. Every year, you can’t go wrong wherever you happen to land. The food vendor list also reads like the who-is-who of the best restaurants in the city, including the returning mainstays like Boswell’s Jamaican Grill, Ajun Cajun, Gulf Tacos, plus snowball and lemonade booths, and plenty of booths with adult beverages from Pal’s, Pearl Wine Company, and others. The ever-growing food menu now includes more gluten-free and vegan options and over 30 local restaurants and caterers. The curated arts market includes more than 60 regional artists, with the booth spread out between the Dumaine Street stage and Orleans Avenue. The Family Village will once again offer games and activities to the kids and families and provide the respite from the heat with its misting fans and shade. New this year is the female performance showcase on the Dumaine Street Stage on Friday, May 18. 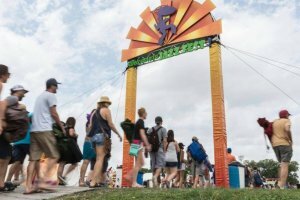 Also new, the nonprofit organization that produces the festival has changed its name from the Mothership Foundation to Friends of Bayou St. John. In the past years, some proceeds have been used to clean litter and plant trees along the bayou. Another change this year is the Canopy Club, the fest’s VIP lounge located next to the main stage. The pass gives you access to a climate-controlled restroom, a private bar, and catered food. The lounge features shade, misting fans, seating, and the stage-front view. You can buy merch online anytime, including the fabulous 2018 festival poster created by the local artist Emma Fick.